One of the figures that shaped the modern European basketball clubs’ scene has died today. Pavlos Giannakopoulos after a long fight with health issues finally lost an uphill battle. Born in 1929, Pavlos Giannakopoulos was the head of the Vianex pharmaceutical company and father of current owner Dimitris Giannakopoulos. From 1987 to 2012, the Giannakopoulos brothers managed Panathinaikos‘ basketball, volleyball, and all amateur sports teams, from athletics to water polo. Their involvement with Panathinaikos‘ basketball team was their greatest success, in both domestic and European competitions. Pavlos was the President of the basketball department from 1987 to 2000 and together with his brother, Thanasis, from 2003 to 2012. Under him, Panathinaikos won six EuroLeague trophies, 13 Greek league championship titles and nine Greek Cups. For many years Panathinaikos had some of the best players in Europe and Giannakopoulos had signed even NBA stars like Antonio Davis – before he made his NBA debut – Byron Scott and above anyone else Dominique Wilkins. 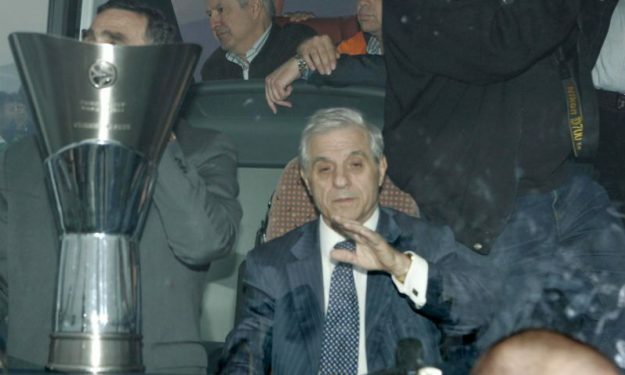 In 2011, Pavlos and Thanasis won the EuroLeague Club Executive of the Year Award. In 2012, Pavlos’ son, Dimitris, took over control of Panathinaikos basketball. In 2015, the indoor hall of Apostolos Nikolaidis Stadium was named “Pavlos Giannakopoulos”, in his honor. The Giannakopoulos family recently lost Pavlos and Thanasis’ younger brother, Kostas.